People have a role in acting to prevent and prepare for emergencies that impact on their animals and plants, their businesses, the environment and the economy. 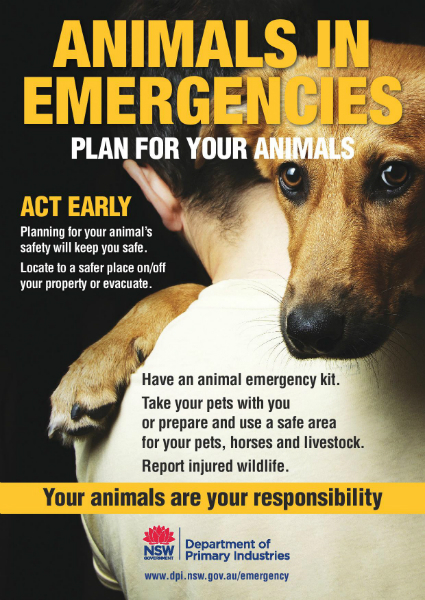 Taking action now can keep you, your family and animals safe and reduce the impact on your property and business. The tips and links below provide useful information to assist you to prepare for a natural disaster. The tips and links below provide useful information to assist you to prepare for a biosecurity emergency. Plant biosecurity requires participation from you to prevent, prepare for, respond to, and recover from invasion or spread of plant pests and diseases. Animal biosecurity protects the economy, human health and the environment from problems associated with pests and diseases of animals. NSW DPI and Local Land Services work with livestock owners, livestock industries, rural communities and other stakeholders to ensure the quality and safety of NSW livestock and livestock products. Aquatic biosecurity protects the economy, human health and the environment from problems associated with aquatic pests, diseases and saltwater weeds. Emergency plant pest reporting and what happens next If you suspect the presence of an exotic plant disease or pest, or if you see unusual symptoms on your plants, immediately call the Exotic Plant Pest Hotline 1800 084 881. Aquatic pests and disease Report unusual disease signs, or unexplained deaths in cultured or wild fish to NSW DPI. Reporting aquatic pests and diseases on 02 4916 3877 (recorded 24 hour hotline). Farm biosecurity Farm biosecurity is a set of measures designed to protect a property from the entry and spread of pests and diseases. Farm biosecurity is your responsibility, and that of every person visiting or working on your property.